In the south, there are two things that are common place in a little girls wardrobe – monogram “everything” and bows. The bigger the better seems to be the theme with birth of these items. At the recommendation of my girlfriends (who just happen to all have girls), I purchased 2 dozen 3″ bows in a variety of colors. Personally I think the 3″ bows might be a pinch large for her little head, but one thing is for certain, she will grow into them. With such fine hair (if they even have hair at all), I was confused how a newborn could even wear a bow. If you were wondering also, take note that the bow is a two-piece accessory. The other piece that you will need is a headband that includes a slot where you clip the bow to attach it. I purchased a few from Etsy. Etsy is such a great resource for these kinds of items. A single bow might cost $5 (or more) at a children’s boutique. On Etsy, you can easily find solid colors for $1 – $3 a piece. Once you’ve stocked up on bows, you may find that you need somewhere to store them. Sure, you could stuff them in a box or drawer, but that’s no fun. 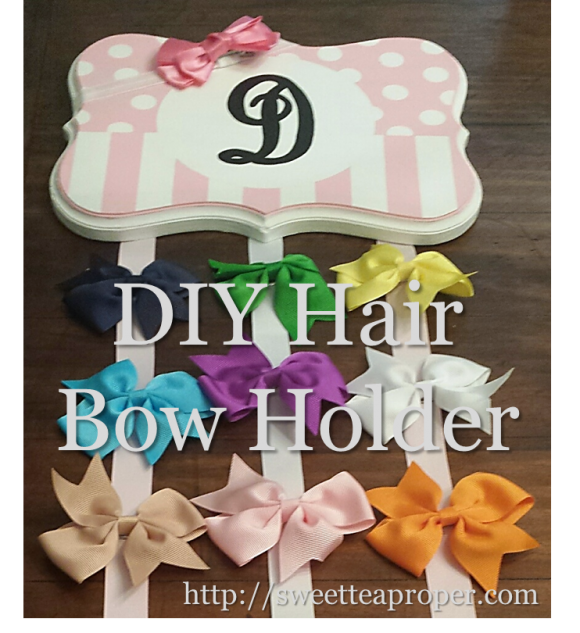 If you have a free afternoon then you have time to create your very own DIY hair bow holder. These hair bow holders make a unique baby shower gift so if you know of someone having a baby girl, consider making two. The time commitment only slightly increases and the overall cost for the project will decrease since you can reuse most of the materials. For this tutorial, we are going to show you how to easily create a wooden hair bow holder, hand painted with stripes, polka dots, and a single letter monogram. If you aren’t the artsy you’re, don’t worry. We have added a few tips along the way to ensure painting success! A friend of ours was also expecting a little girl so we made two hair bow holders, one for Cecilia and one for Della (*we just love this unique family name). 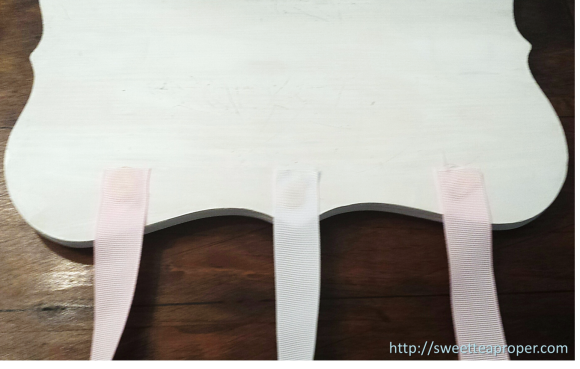 For our hair bow holders, we used white and a light pink. Since white is easy to paint over with any color, it is a good base regardless of your overall color choice. 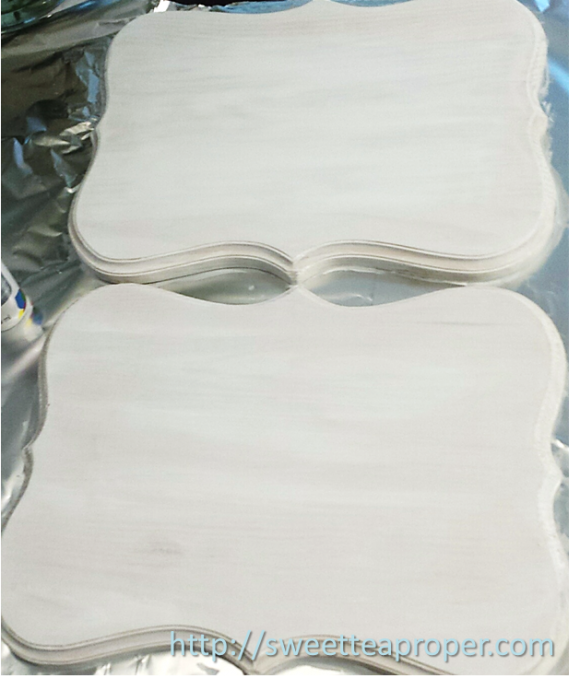 The acrylic paint is inexpensive so we recommend using the white regardless if it is your end color choice or not. We were out of newspaper so we had to use tin foil as a table protector. Make sure to put something underneath the plaque before painting. Even if you are an experienced painter, it is nice to have a precautionary measure in place – just in case! 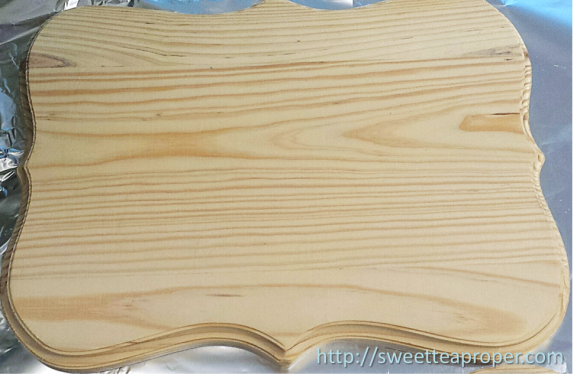 Using the large paintbrush, paint the back side of the wooden plaque. Allow at least an hour to dry (the acrylic paint from the hobby store dries quickly). Apply another coat of paint to the back side. Allow at least an hour to dry. Once the back side is completely dry (you can touch it with your fingertip to make sure), flip the plaque over and paint the first coat on the front side. Allow time to dry and paint the second coat on the front side. Using a cereal bowl (or another round object) and a pencil, lightly trace a circle in the center of the plaque. 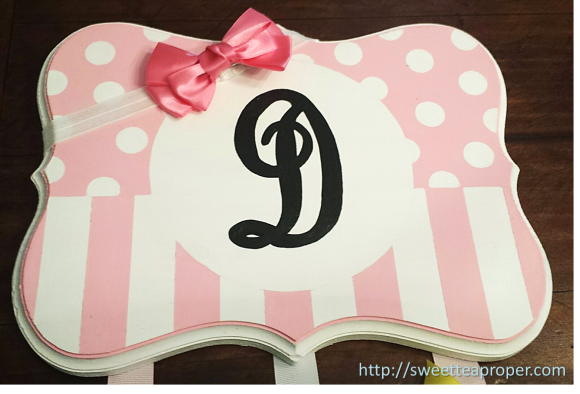 Since our hair bow holder has both polka dots and stripes, we need a divider line to know where to start each section. Using a pencil, lightly draw a horizontal line through the middle (or wherever you would like the divide to be) of the plaque. You DO NOT want to draw the line through the circle that we just traced, but rather a line on each side. 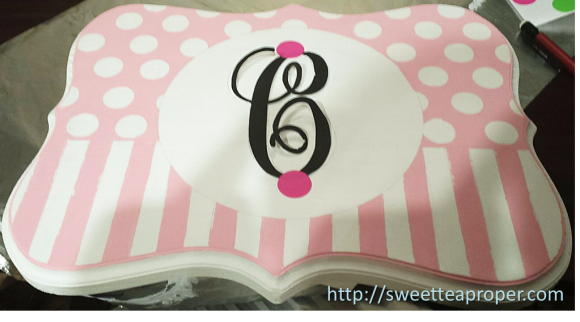 For Cecilia’s hair bow holder, we originally tried to free hand the stripes. This was a bad idea. If you have a steady hand, you might find this to be quicker, but that was not the case for us. To create perfect stripes (with just a little touch up afterwards), apply painter’s tape evenly across the plaque. Using the large or medium brush, liberally apply your alternating color on the stripes. It’s ok if it gets on the painter’s tape. That is part of what makes it so wonderful to use. Allow at least an hour to dry. Apply second coat. Once fully dry, remove the painter’s tape. Using the small paintbrush, touch up the lines as needed. These round stickers can be found at most stores. They do not provide as clean of a line as the painter’s tape, but I can promise you that it is better than trying to free hand a bunch of circles. Apply the round stickers to the opposite section on the plaque. You can have the stickers uniformed or spread out randomly. For ease of painting, it is helpful to leave the horizontal painter’s tape attached to separate the two sections. If you already removed it, just add another piece (that’s what we had to do). Assuming your top section is completely dry, it should not pull off the paint from the stripes. With the large paintbrush, paint the entire bottom section. Be careful not to get paint in your center circle, but feel free to paint over the round stickers. Allow an hour to dry and apply the second coat of paint. Once completely dry, remove the stickers. Using the small paintbrush, touch up the paint as needed. There is no way that I could freehand a perfect monogram with my handwriting so I like to go to the next best thing – tracing. If you don’t already have a monogramming font saved on your computer, you can find a free one to download at dafont.com. The website tells you step by step how to download their fonts to your computer. Most of these fonts are free to use as long as it’s for personal use. Once you have the font selected, go into Microsoft PowerPoint (you could also use Paint or possibly Word). Add a circle that is approximately the same size as the circle in the center of the plaque. 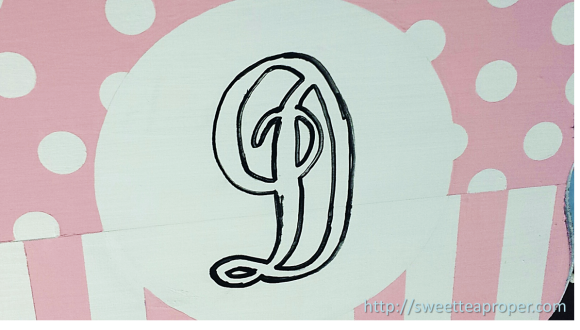 This step isn’t required per se, but it does make it easier to eyeball how large the monogram should be. Add a text box inside of the circle. Type in the initial for the stencil and resize as needed. You may want to set the font to Bold to make it a little thicker. Print out the stencil on regular computer paper. 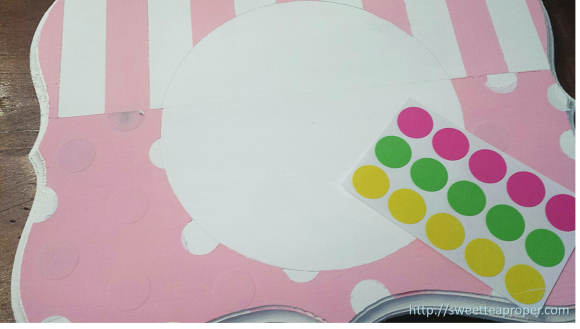 Carefully cut the stencil out and tape to the center of the circle. 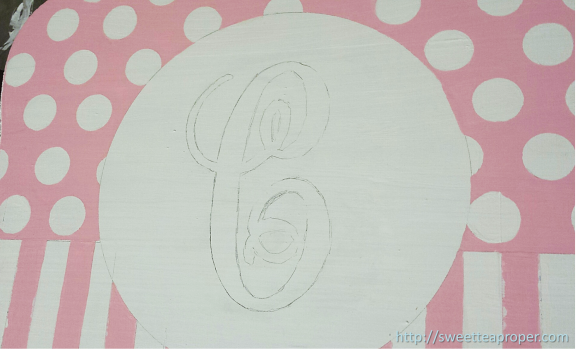 With a pencil, lightly trace the outside of the monogram in the center of the circle on the plaque. It’s ok if it is not perfect. You can touch it up on the next step. Remove the stencil and you should have something similar to the picture below. Using the paint pen (we chose black, but there are many different options at the craft store), go over the pencil outline as shown below. The paint pen is great for outlining, but we didn’t prefer it’s texture for the overall finish. We decided to paint the inside of the monograms with regular acrylic paint. You could do the same or fill in the monogrammed letters with the paint pen. Your choice! Once you get to this stage, allow the letters to dry completely and the front part of the hair bow holders are done! If you have not already cut your ribbon, do so now. With the width of these plaques and the intentions of hanging 3″ bows, three ribbon strands is the ideal. We cut our ribbons down to 24″ each. If the ends of the ribbons are frayed, you can either burn the ends gently or sew the ends to avoid additional fraying. 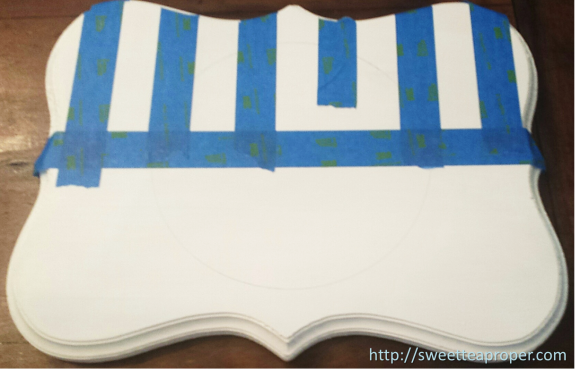 Using the hot glue gun, add a small amount to one end of each ribbon and press securely to the back of the plaque. Evenly space the other ribbons (ours are about 3″ apart). The hair bow holder is meant to be hung on the wall so you will need some form of a hanger. We chose these sawtooth hangers. 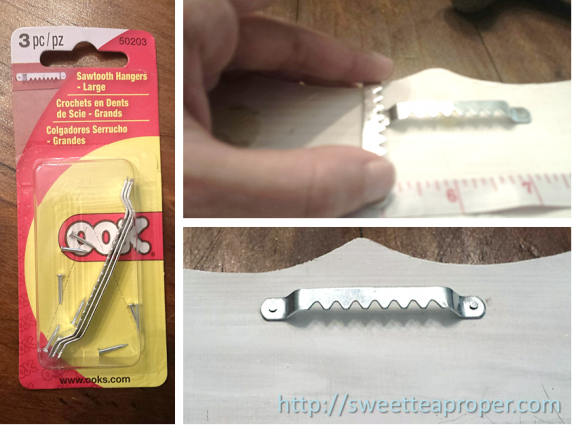 They are very easy to use, but it is tricky to get those tiny nails into the wood. The picture below (top right) shows a little trick that helps to hold the nail up as you hammer it in. Unfortunately, it only worked out for the first plaque since we needed a second hanger to make it work. Place the sawtooth hanger on the top center of the plaque. Using the other hanger, set your nail upright to drive it in. If you don’t have another hanger, you will have to do your best holding it up with your finger (this was my least favorite part of the whole project). Hammer in the nails on each side to secure the hanger. Once the hanger is attached, the project is complete! For Della’s hair bow holder, we added a headband and bow to the top (just in case this new mama wasn’t sure how the headband/bow thing worked either and to give it a little something extra). We also included a dozen bows to get her started on her collection. A girl can never have too many bows! Cecilia’s hair bow holder easily holds the two dozen 3″ bows that we purchased for her. If you need the holder to hold more than this, you could tie or hot glue additional ribbons to the bottom of these or use a longer ribbon to start with.